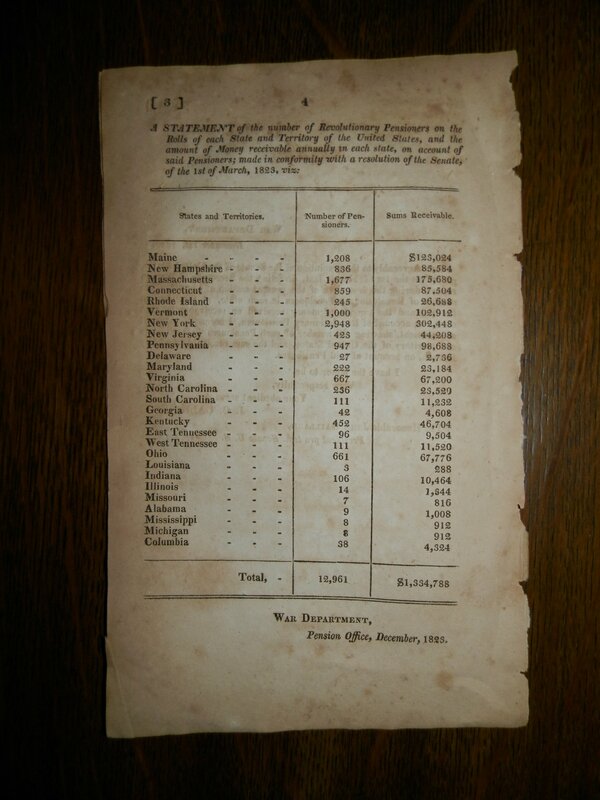 December 21, 2014 - FOFSD has acquired this historical document listing the number of Revolutionary War pensioners on record in 1823, 40 years after the war ended. 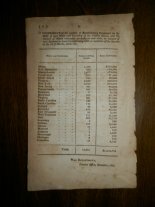 "A STATEMENT of the number of Revolutionary Pensioners on the Rolls of each State and Territory of the United States, and the amount of Money receivable annually in each state, on account of said Pensioners; made in conformity with a resolution of the Senate, of the 1st of March, 1823." note: The Distict of Columbia is referred to as simply "Columbia." To download the full-size image (1728x2304), click on the thumbnail. 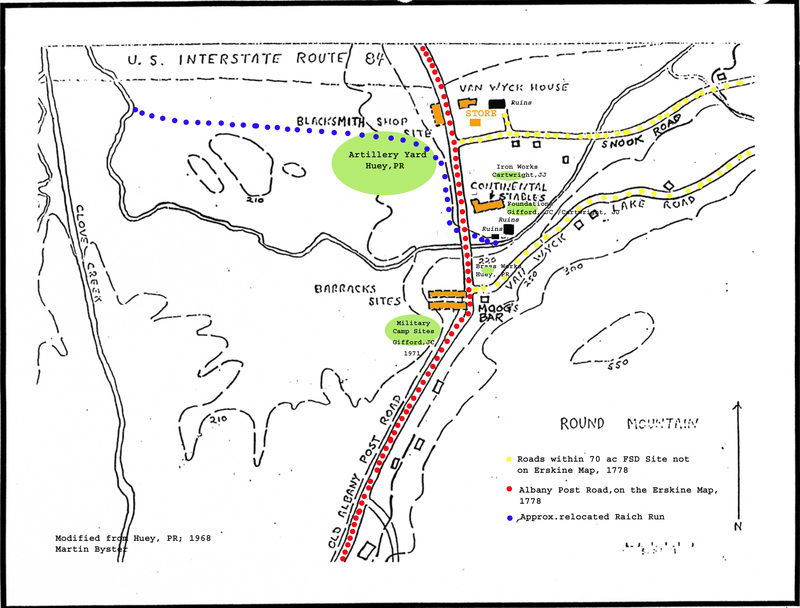 The Fishkill Supply Depot and Encampment During the Years 1776-78, by Richard Goring, 1975.
fold3.com is the web's premier collection of original military records and is our primary source for researching the soldiers who died at Fishkill. The fold3 name comes from a traditional flag folding ceremony in which the third fold is made in honor and remembrance of veterans who served in defense of their country and to maintain peace throughout the world. Ancestry.com is the world's largest online family history resource. As of December 2013, the company provided access to approximately 12.7 billion records and had 2.14 million paying subscribers. User-generated content included 191 million uploaded photos and more than 16 million uploaded stories. Other sources include the Daughters of the American Revolution (D.A.R. ), the Sons of the American Revolution (S.A.R.) and the Society of the Cincinnati, the nation's oldest patriotic organization, founded in 1783 by officers of the Continental Army and their French counterparts who served together in the American Revolution. Excerpt from the "Pictorial Field Book of the Revolution" Volume 1, Chapter XXIX by Benson J. Lossing, 1850. 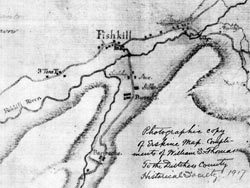 "Fishkill village lies pleasantly in the lap of a plain near the foot of the mountains, and is a place of much interest to the student of our history. Securely sheltered by high mountains from invasion from below, and surrounded by a fertile country, it was chosen as a place of safe depository for military stores; for the confinement of Tory prisoners and others captured by strategy or in partisan skirmishes upon the Neutral Ground, in West Chester; and, for a while, as the place of encampment of a portion of the Continental army, and the quiet deliberations of the state Legislature. 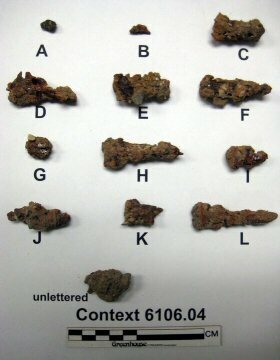 49 The barracks were about half a mile south of the village, extending along the line of the road, from the residence of Isaac Van Wyck, Esq., to the foot of the mountains. The head-quarters of the officers were at Mr. Van Wyck's (shown below), then the property of a Mr. Wharton. From this circumstance it is known as 'The Wharton House.' 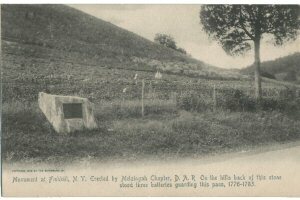 The burial-place of the soldiers is at the foot of the mountains, where a road branches eastward from the turnpike..."
The Van Wyck Homestead or Van Wyck-Wharton House is an early 18th-century Dutch colonial house in the Town of Fishkill, New York, United States of America. It served as a headquarters to a major military supply depot during the American Revolutionary War and has been listed on the National Register of Historic Places since April 13, 1972. "... it is doubtful whether any spot in the State has as many of the buried dead of the Revolution as this quiet spot." Postcard (circa 1905) depicting the original placement of the D.A.R. "Monument of the Soldiers of the War of the Revolution" in Fishkill, NY. 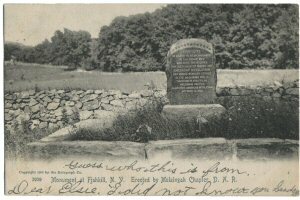 Moved from its place near the burial ground, the monument now rests at the Van Wyck Homestead. Read the Monument Dedication Ceremonies, an insightful story from the 1897 event (a must for researchers). Another postcard (circa 1904) shows the "Monument to the Batteries" located about a mile south of the depot along Route 9. Placed by the Melzingah Chapter of the Daughters of the American Revoluton, the plaque is inscribed with the words: On the hills back of this stone stood three batteries guarding this pass 1776-1783.